Whilst some people may still want to play it safe, there is a trend for more colour in the kitchen. Not everyone will be tempted by a hot pink but there is a move away from the ever-popular grey towards other colours, with different shades of blue and green top of the list. 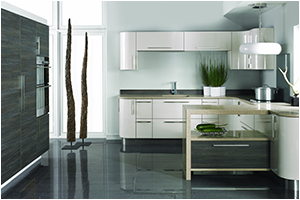 Darker shades such as navy blue and graphite can create a striking look for a kitchen. Clever lighting and the introduction of contrasting white or metallic accessories can avoid a dark design feeling claustrophobic. Combining two shades, a lighter and a darker hue can also work well, especially with so many gorgeous shades of blue available. 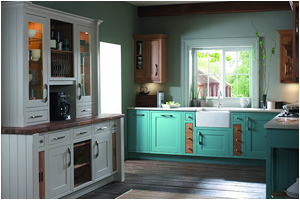 The Denim blue and Smoke blue combination from trend Kitchens that was launched recently is a great example. Blue can take on many forms from dark and moody to soft and relaxing. Seaside blues can create the feel of a coastal kitchen, whilst pale blues can reflect more of a scandi vibe. Green can a calming colour choice and ideal for the kitchen as we often associate it with nature and freshness. From bold and bright lime greens to more subtle sage greens, there is plenty of scope to be creative. Dark emerald green can work well with a painted shaker style, where as a jade green can be more modern with a flat door, especially when teamed with some trendy silver mosaic tiles. If you are undecided about which way to go on colour you can consider the size, shape and natural lighting available in your kitchen, as these factors will influence how successful your chosen colour scheme will be. As a general rule if you have a limited space or low-ceilinged kitchen with little natural light, then choosing a lighter palette or a gloss finish will help the available light bounce around the room and make it feel bigger. If you have a larger room with lots of natural light, this gives you more options to experiment with different colours and darker shades. A neutral colour can take splashes of colour and is a good option if you want a classic colour scheme that will stand the test of time. You can add a strong accent colour with a feature wall, an island or a free-standing dresser. We can also add light and interest by introducing different textures and tonal shades of muted colours. We work with the whole of the kitchen when considering the colour scheme, not just the furniture – the worktops, splashbacks and floors should all be designed to blend in with the rest of the kitchen. We would love to help you design your perfect colour scheme in the kitchen, why not make an appointment to meet with one of our experienced designers and start planning your own colour scheme?